I'm very happy to be a part of the Around the World Blog Hop today! I was invited by Leslie from Leslie Unfinished! If you haven't been on her blog before do stop by. She makes beautiful and interesting things and even shares some great recipes! For the hop I'm supposed to answer a few questions and tag people to post next Monday, September 29th. Like many quilters I have a long list of WIPs but right now I am working on my Eastern Sunrise Quilt top. This is a paper-pieced pattern that I designed. 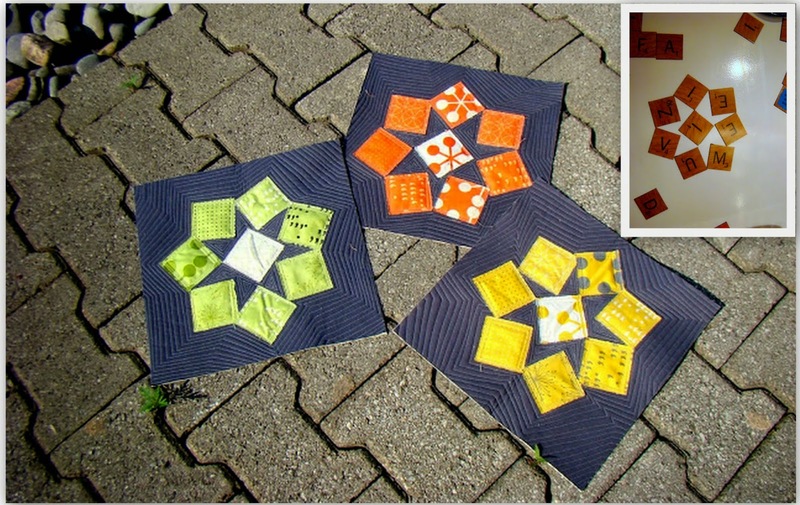 You can download it for free here: Eastern Sunrise Quilt Block. This is a long story but the gist of it is - I was turning 30. I was unhappy with the way my life was going. I took a year to find myself and what I wanted to do with my life. Asked the hard questions. Made difficult choices. Spent time figuring what I liked and did not like and what would make me happy for the next 30 years and Quilting came up on top! I see patterns everywhere I go. I love to see and touch fabric and I love the sound of the sewing machine! Some nights, when I can't sleep I imagine I'm sewing and it calms me! So really - I can't help myself! I have to quilt - it is who I am now. I also quilt because quilts bring comfort, tell stories, and shape lives. I recently made a quilt for my mum and she tells me she thinks of me every night when she covers herself with the quilt and sends up a little prayer for me. Having the quilt makes her feel a little closer to me, and makes me feel a little closer to her. I think of the babies that are wrapped in my quilts when they are born, children who sleep under them as they grow, and friends and loved ones who (I hope) will receive some comfort and warmth from a quilt I give them and it makes me feel like I have done something beautiful in the world. Something small - but beautiful. Sometimes I draw sketches and work out my pattern and yardage etc. Other times I feel like I just need to make something so I whip out some charm packs and sew them together! More often than not I see something and think - that could be a quilt so I work out a pattern for it. Eastern Sunrise was inspired by a young girl's jacket on the subway. I carry a little notebook/sketchpad with me all the time and when I see something that is interesting I start drawing/designing. The end result isn't always like the initial trigger but that's what's good about the process. You see something and then make something new with it. In the Pipeline was inspired by a game my aunt had on her phone. In the game you had to connect pipes so you get water to flow from Point A to Point B. I quite enjoyed the game and I love mazes so I thought it would be fun on a quilt! The maze on this quilt works - there will be a start and finish! This quilt has been very interesting to make. I started with a sketch and then tried to work out the math and realized that it was quite pointless. So I make the quilt as I go... measuring and cutting and piecing (partial seams are very useful). Thank You for taking the time to be here today! Sarah from mila+cuatro and Tina from Holy Scrap! Sarah is from New Zealand and has a lovely blog and makes the most fun things. I love all the bright colours in her projects. Sarah and Tina will be posting next Monday. Many thanks again to Leslie from Leslie Unfinished! I love that you think of sewing when you can't sleep! Sometimes thinking of sewing while trying to sleep keeps me awake, especially when a quilt design pops into my head at 4am and I start plotting how I will make it. I think its the steady whirring sound of a sewing machine - takes me to a happy place. I love your reasons for quilting in question 2. :) I agree, a homemade quilt adds a bit of beauty and love to the world. I love your pipeline quilt, great design and colors. Enjoyed reading about your creative process.